Driving along Simi Valley’s main street near lunch time, you may spot a cloud of smoke in the distance billowing from a sidewalk. As you get closer, going past the motor bike and hot tub stores, something will start to smell really, really good. That’s Green Acres market, where every day they have a massive outdoor barbecue with the tenderest chicken I’ve ever tasted. The first time I came across Green Acres was at my local Vons meat counter. It was the second place I’d visited that day on the quest for a nice joint of beef on the bone for a traditional Sunday roast. The old butcher behind the counter shook his head at my request, that’s not something they had any demand for, straightforward cuts and ground beef were all they carried. Seeing the disappointment on my face he looked from side to side and then leant over the counter. "Try Green Acres market on Los Angeles Avenue, between Sycamore and Tapo Canyon". Walking in, it wasn’t much bigger than a 7-11, but the whole of one long wall was taken up with fresh meat. One end started off with more styles of steak than I knew existed, ready to be cut to your liking. After that there was everything from pork, chicken and fish to pre-mixed marinaded selections for all sorts of dishes. Talking to the butcher serving me, he was able to help me pick out exactly the cut and size I wanted. After handing over a lovely prime rib joint, he reached under the counter and gave me a printed note card with their house recipe for perfect prime rib. It surprised me with a low temperature only 200 degrees farenheit for the last couple of hours, after an initial browning phase, but the result was the best roast I’ve ever cooked, with the meat melting in your mouth. 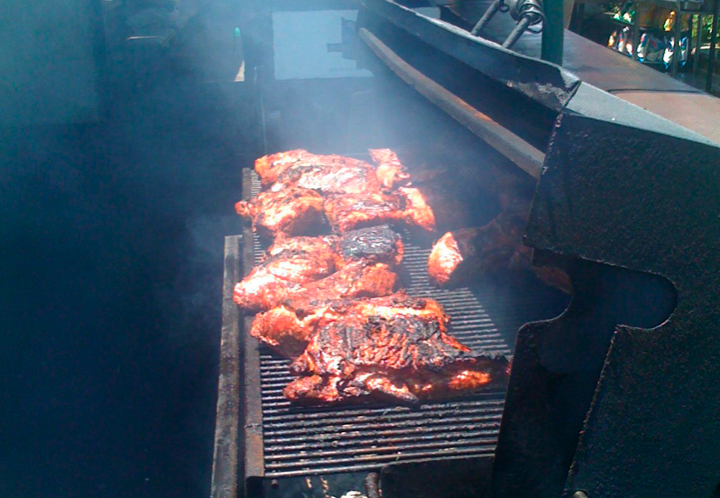 Their lunchtime barbecue is made with the same fresh meat they sell, and expertly cooked. Biting into their chicken sandwich is a beautiful experience, though probably one you want to keep a secret from your cardiologist thanks to their buttered rolls. The chicken is light and soft, with a barbecue sauce that still lets you taste the meat. I’ve never used their catering service myself, but it’s top of my list for the next time I food at an event.